An exciting and fun team activity , new for 2018. Suitable for all ages and abilities ( minimum age 11 ). Paintballing with bows and arrows. Takes place in a wooded outdoor environment near Hay-on-Wye. A half day activity consisting of a number of games involving the elimination of all members of the opposing team and hitting targets. Competetive and compulsive! We encourage a bit of role play so feel free to dress up and get involved. 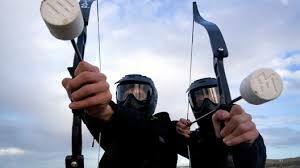 Archery is suitable as a half day session and can also be incorporated in the team challenge day. Although based around Hay-on-Wye we are able to set up in other locations if required. These sessions are geared towards the beginner and begin with a comprehensive tutorial combined with a safety talk then followed by competitions and games. You will helped to improve as the session progresses. Modern recurve bows are used on an outdoor, grass range. Its advisable to therefore wear clothing suitable for weather and ground conditions. A long sleeved outer layer is advised to protect the arms. Great activity for all ages, we provide a wide range of games and challenges to keep the session fun and stimulating. If you are staying at a holiday cottage, campsite or similar we may be able to come to you and set up a session - handy if you have young kids. Let us know where you are staying!